Peter de Peinder (1967) studied Chemistry, Major Biochemistry, at Utrecht University and became subsequently member of the Vibrational Spectroscopy department of Utrecht University as a junior scientist. He joined Philips in 1999 and became senior scientist at the Material Analysis department of Philips Research and from 2000-2004 he was part-time scientist at Utrecht University. 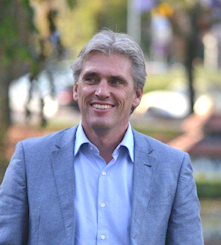 In 2006 he left Philips Research Eindhoven and he focused on his activities for VibSpec. Currently his interests are focused on the interpretation of vibrational spectra, surface enhanced IR and Raman spectroscopy, nanoIR, pharmaceuticals, polymers, catalysis, process analysis and multivariate data analysis. In 2009 he obtained his PhD in chemistry on the characterization of crude oils by a combination of spectroscopy and chemometrics. He is a board-member of the Dutch Infrared and Raman Discussion Group (IRDG) since 2002 and was a board-member of the Section Analytical Chemistry (SAC) of the Dutch Royal Chemical Society (KNCV) from 2008 to 2014. In 2010 he became an editorial board member of the journal Vibrational Spectroscopy.